The Cellist Imola Gombos was born in Budapest. She was prize-winner of the national Hungarian cello-competition in both 1990 and 1993. In 1997 she received the diploma in paedagogic and chamber-music from the Ferenc-Liszt-University. Imola Gombos continued to study baroque cello and viola da gamba with Rainer Zipperling at the "Hochschule für Musik und Darstellende Kunst" in Frankfurt where she received her diploma in 2005. Finally she completed her studies at the "Hochschule für Künste" in Bremen with Hille Perl. 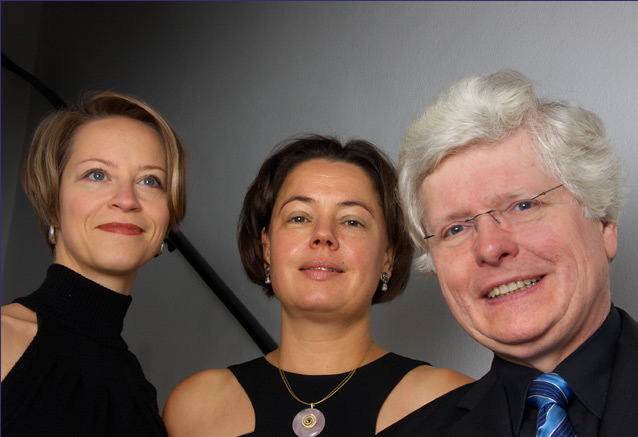 Imola Gombos has performed with Monica Hugget, John Holloway, Barthold Kuijken, Gabriel Garrido, "Weser Renaissance", "Das Kleine Konzert" and “Concerto Köln”. Annette Wehnert studied violin in Cologne, Düsseldorf and Bloomington. She was a member of the „Deutsche Oper am Rhein“ from 1991 to 1995. She has played in numerous baroque groups including „Concerto Köln“, „musica antiqua köln“, „La Stagione Frankfurt“, and the „Freiburger Barockorchester“, and since 1998 she has been principal violinist with the „Kölner Akademie“. Her chamber music activities include regular appearances with groups as „Camerata Köln“ and „Epoca barocca“. She rounds of her musical activities with teaching, since 1989 at the music conservatory of the city of Cologne as well as directing courses in early music performance in places as widely places as the „Enescu University“ in Bucharest and the „University Potchefstroom“ in South Africa. Harald Hoeren began his musical career with “Camerata Köln”. As a harpsichordist and fortepiano player he has recorded over 100 CDs with music ranging from the early baroque to the Viennese classics. Apart from solo appearances he devotes his time in TRIO 1790. His concert tours have taken him through nearly all of central and western Europe, Asia, North America and South America. In 1983 and 1990 he was visiting professor at the University of the Philippines in Manila. Since 1984 he has taught historical keyboard instruments at the Frankfurt Academy of Music, where he was granted professorship in 1999.